My dad passed away several years ago. Instead of a “Father-Daughter dance,” I dedicated two songs to both my parents and invited everyone join me on the dance floor: The songs were “September” by Earth, Wind and Fire (both my parents were huge fans) and Come On Eileen (because my Mom’s name is Eileen). All of our guests (all 51 of them) got up and danced and laughed with us. Our “flower girl” behaved! 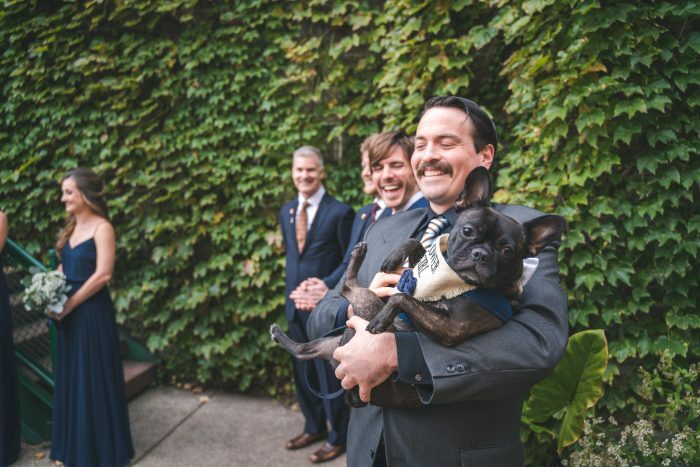 A good friend carried our french bulldog/Boston terrier/”flower girl” Barkley down the aisle. She didn’t Bark once during the ceremony and she was surprisingly photogenic. 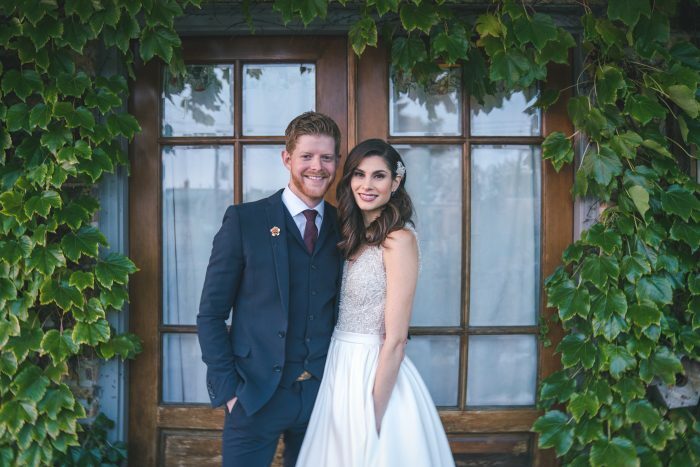 Also, I wore a Madison James dress with pockets and it really dazzled our guests when I pulled my vows out of my (surprise) pockets. My mom gave traditional Irish and Scottish toasts to honor both the bride and groom’s families. We went to our first all-inclusive resort, Excellence El Carmen, in Punta Cana. The weather was near perfect. It rained for less than 10 minutes the first day of our stay and the rest of the trip was sunny and beautiful. We highly recommend the 2-floor suite with a private plunge pool. We soaked up the sun and listened to “The Greatest Love Story Every Told” audiobook by Megan Mullally and Nick Offerman. 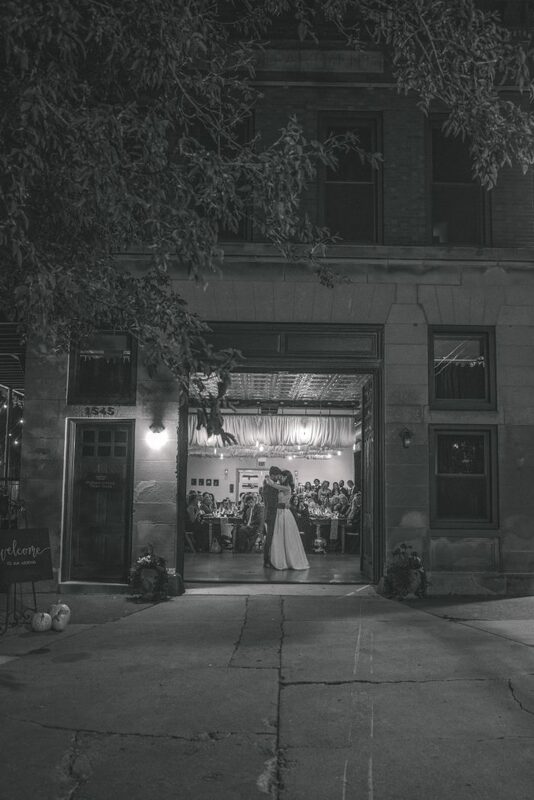 We loved our venue, Firehouse Chicago, so much that it was the first and only venue we visited. They have beautiful wooden farmhouse tables and antique fixtures. It was less than 2 miles away from our home but has such rustic, homey vibe that you almost forget you’re in the Windy City. 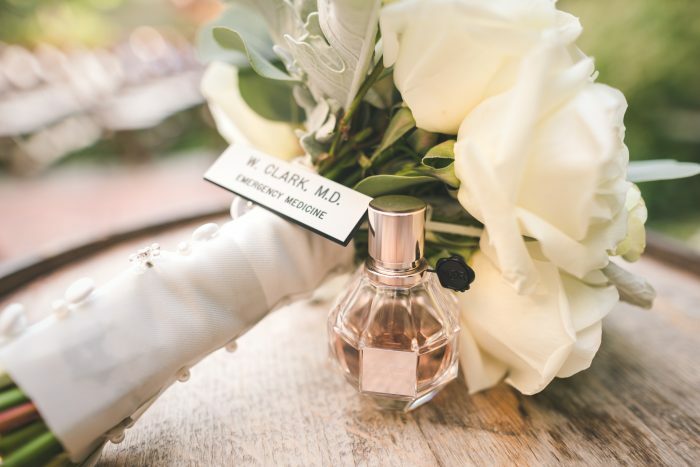 It was perfect for our small wedding. 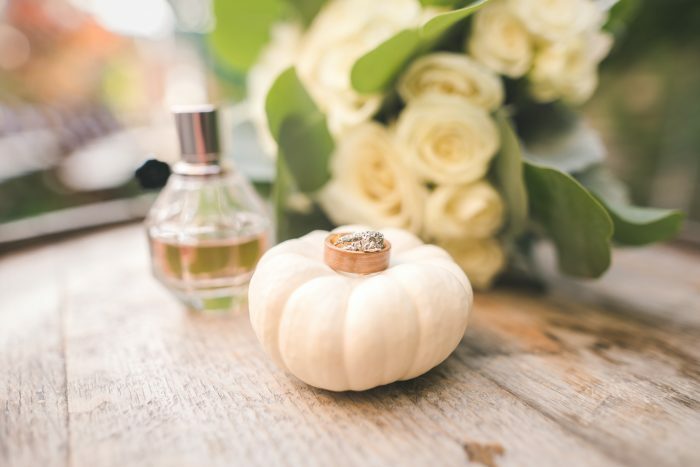 We were aiming to have a fall wedding because my husband proposed with his great grandmother’s ring; and the matching wedding band has her wedding anniversary engraved on it, October 20, 1920. We thought it would be great if we could get married on or close to his great grandparent’s anniversary. Firehouse Chicago happened to have one fall date left in October of 2018 so we snatched it up. 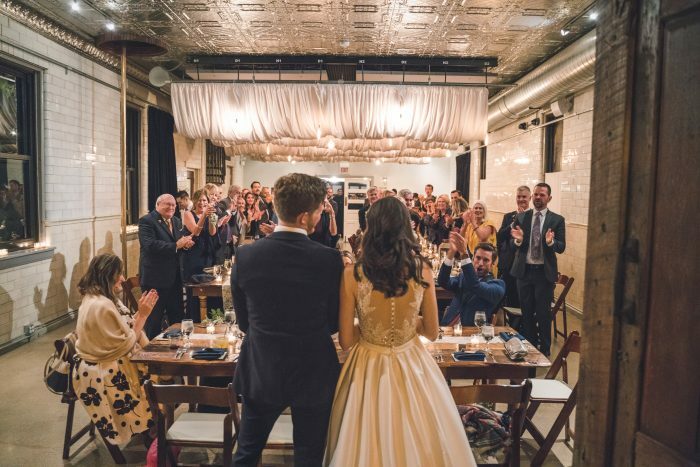 We had our little ceremony at Firehouse Chicago on October 13th, and legally married on October 20, 2018—so we technically we were married 98 years exactly after my husband’s great grandparents were married. Getting another puppy! Rob found and named our first dog, Barkley. So Erin wants to name the second dog, and she likes the name Donut. This was taken a few minutes after our ceremony. 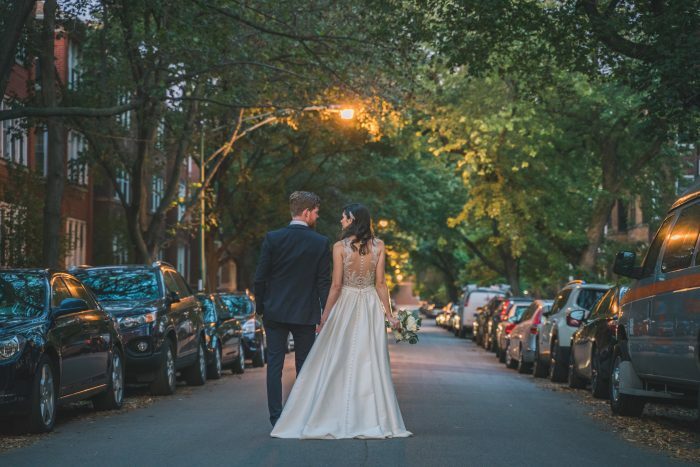 We just had our first sips of our signature cocktails (The Bride was a margarita and the Groom was a bourbon mule) and then we took some pictures right outside the Firehouse Chicago on Rosemont Avenue. 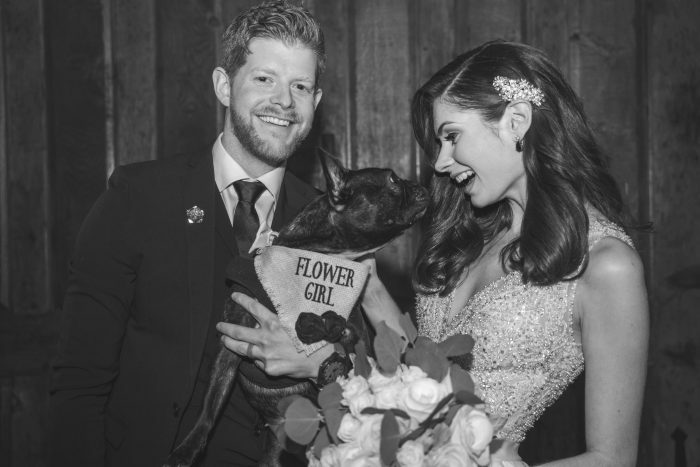 Our usher/good friend Zach agreed to walk our “flower girl” aka our dog Barkley down the aisle. Everyone laughed out loud when she made her entrance. Barkley is wearing a “Flower Girl” burlap bandana by Hello Hazel. Rob’s sister, Kelsey, was a bridesmaid and Erin’s first cousin, Jackie, was maid of honor. Rob’s brother, Russel, was Best Man and Erin’s brother, Patrick, was a groomsman. We used gold from my grandpa’s ring to make the inner liner of my husband’s ring. The liner is gold and the outside is oak, made by the craftsman at Simply Wood Rings in Chicago. 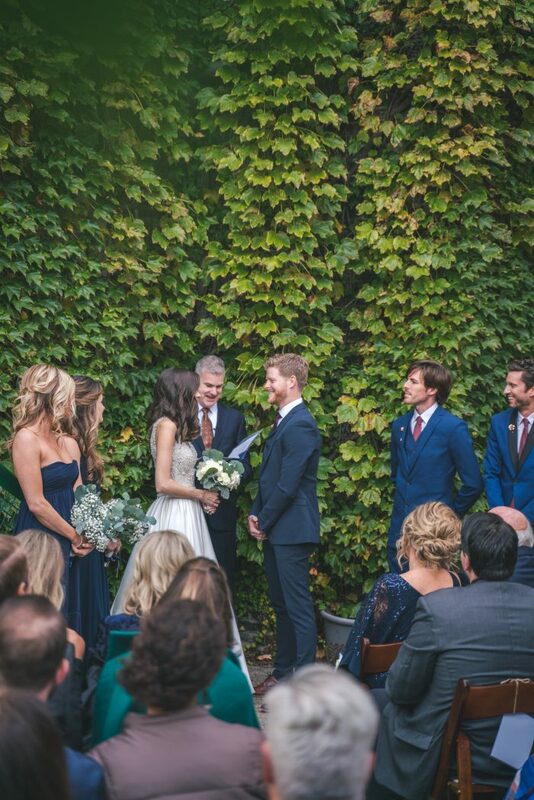 My awesome Uncle Bill officiated our ceremony. (I am the third of his nieces/nephews for whom he has officiate their nuptials!) The wedding party walked down the aisle to a string rendition of “Your Song” by Elton John, performed by White Lake Quartet. My older brother walked me down the aisle to Debussy’s “Claire de Lun.” That song reminds me of the end of the heist movie “Ocean’s Eleven, ” a movie that our late Dad really enjoyed. Our florist Nancy kindly incorporated my late Dad’s ID badge into my bouquet of white roses and eucalyptus. She also wrapped my flowers in extra fabric—leftover after my dress had been altered. Firehouse Chicago has these big beautiful wooden doors at the front and we used those for our grand entrance into the reception, to the tune of the Jurassic Park theme song. We couldn’t decide on one cake flavor for the reception, so we served carrot cake + brown butter icing, red velvet + cream cheese icing and vanilla + buttercream cupcakes from Molly’s. The bride has been a fan of Molly’s for years (since her freshman year at Loyola Chicago). Our friend/singer/song writer extraordinaire Liz Chidester sang “Can’t Help Falling In Love” and played the ukulele. She was perfect. This family photo was taken after the ceremony and during cocktail hour.